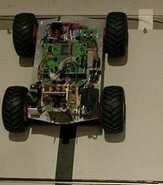 Please see some videos from the development of distance control in the Faller Car 3.0 based on positioning and control of the car using DCC over radio. 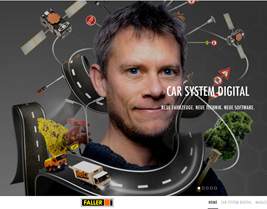 GamesOnTrack developed the The Faller Car 3.0 System (in short Car) together with Faller and Uhlenbrock. In this project we delivered some very important key components. Firstly we delivered our 2-way radio-system which allow any user to transmit DCC commands to Cars and receive status from the Car. Secondly we delivered the GT-Position system which tracks a Car with about 10 mm precision every 80 ms. And for the third part we delivered the PC-system including the complete control and automation system as a further development of our well known GT-Command system. It is not just much the delivery and quality of the individual components but more than that bringing it all together in a 3D graphical environment where we also deal with the not perfect physical world. It has required new methods for dealing with the unforeseen events and tools for users so they can optimze and understand their individual system and bring it live in customer environement. We strongly beleive there is no such competing system out there which for affordable money can provide the same reliability and capabilities. For the Customers it means a much more interactive play and many new facilities and automations for developers of layouts with cars as well as trains. They play together using the same position system thus knowing where all other vehicles are right now. From a technical perspective the project has involved everything from SW-Development in Visual Studio and C# to microprocessor firmware in Atmel processors to PCB and electronic development and manufacturing (sourced) of our small components. And for Faller to establish the approval of the whole system within the EN 300-220-1 SRD norm. We are proud of bringing that system live together with Uhlenbrock and Faller.